How does your organization assess compliance? 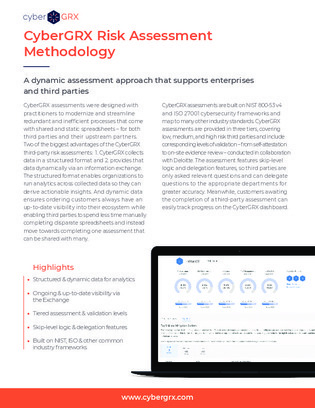 CyberGRX assessments apply a dynamic and comprehensive approach to risk management, using advanced analytics, threat intelligence and sophisticated risk models, to provide an in-depth view of how a vendor’s security controls will protect against potential threats. Download this white paper to learn how you can have an up to date view of your third-party portfolio, and spend less time filling in redundant spreadsheets.